The bells, mouth up and ready for ringing. The band for the Queen’s Diamond Jubilee. 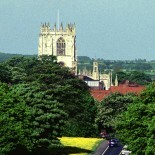 St Mary’s has an active band of ringers and a ring of 10 bells with the tenor weighing 34cwts in the note of Db. We ring on Sundays from 9am for the 9.45am Parish Communion service and from 5.30pm for Evening Prayer at 6.30pm. Our practice night is Wednesday from 7.30pm to 9.00pm. We welcome anyone who has an interest in ringing or would like to learn. Please contact us via the following form.